Authorities in Spain and Andorra have moved to allay fears that a waterway where bottled water is sourced has been contaminated, after it turned an alarming sickly green color. The River Valira, which runs between Andorra and Spain, took on the bright emerald green hue on Thursday, leading to scores of puzzled posts online. The incredible Hulk pees in the river of my little country. Some people suggested the newly green waters had something to do with the Irish St Patrick’s Day celebrations on March 17. However, the cause has been revealed by the mayor of Seu d’Urgell in the Catalan Pyrenees, Spain to have no connection with either the Irish holiday or to a dangerous contaminant. 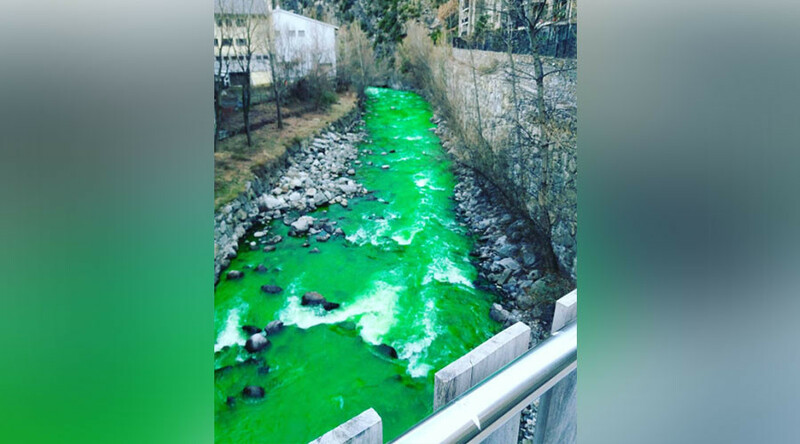 According to Mayor Albert Batalla, the glowing hue was part of a water test which used biodegradable dyes on the Arinsal River north of the Spanish border which has continued downstream. “It seems that the tests were limited to the Arinsal river, but the color has gone downstream,” Batalla said. He added that the color should disappear in the coming hours. Andorra’s Ministry for Health has also released a notice informing people that the dye is being used to trace areas that could potentially be hit by real contamination. “The coloration of the river resulting from research in the Arinsal is safe both for people and for the environment,” it read. The government added that the research results will be included in a water report in May. Last year some 3,166 people contracted a gastroenteritis stomach virus from water bottled in the Arinsal, reported El País. The bottles were sourced in Andorra but later sold in the Spanish cities of Barcelona and Tarragona.